A Wedding Anniversary report enables you to create a list of wedding anniversaries that includes each member's name and contact information. This report gives staff quick access to member wedding anniversary information that can be used for anniversary announcements, mailings, emails, and other wedding anniversary acknowledgements. If you want to generate a list of anniversaries for specific members, check the box to each member's name. Then, go to Step 3. If you want to generate a complete list of member anniversaries, click (in the column header) to select all members in the Member List. Then, go to Step 3. Click to open the Filter window. If you want to create a wedding anniversary list for a specific family group or workgroup, select the family group or check the name of the workgroup. Then, click Apply. 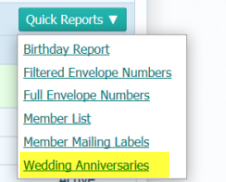 If you want to create a list that shows members who are celebrating significant wedding anniversaries (for example, 1st, 10th, or 25th), click Advanced Options. 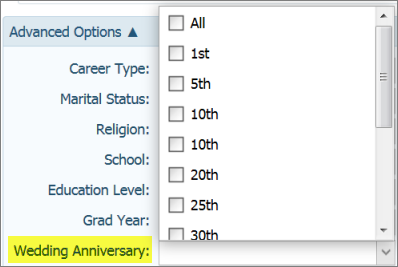 Scroll down to the Wedding Anniversary option, check the desired milestone anniversaries, and then click Apply. If you want to create list of wedding anniversaries celebrated in a specific month, click Advanced Options. 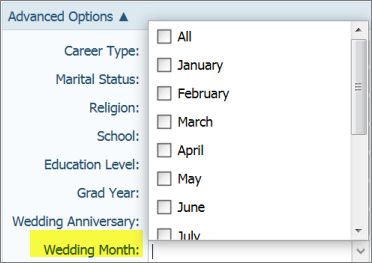 Scroll down to the Wedding Month option, check the desired month, and then click Apply. The Member List updates with your filter selections. Use the toolbar functions to view, save, print, or export the file.